With transparency and availability of information across all media channels, most importantly the internet, organizations can no longer afford to delay or conceal activities or events that impact the workplace and environmental safety. New Global Regulations in effect, most notably the GHS standard which unifies chemical hazard labeling and Safety Information in every country, make it easier to implement and monitor processes for safer handling, storage, and disposal of chemicals. Lastly, and perhaps most importantly, corporate management has come to view EHS related budget expenses, specifically in the area of EHS software acquisition and implementation, as an investment that achieves direct cost savings across the organization. Cost-savings are achieved not only in the cost of chemical purchasing but also in chemical waste disposal and resource allocation. The cost of purchasing a chemical is only a fraction of its total cost. 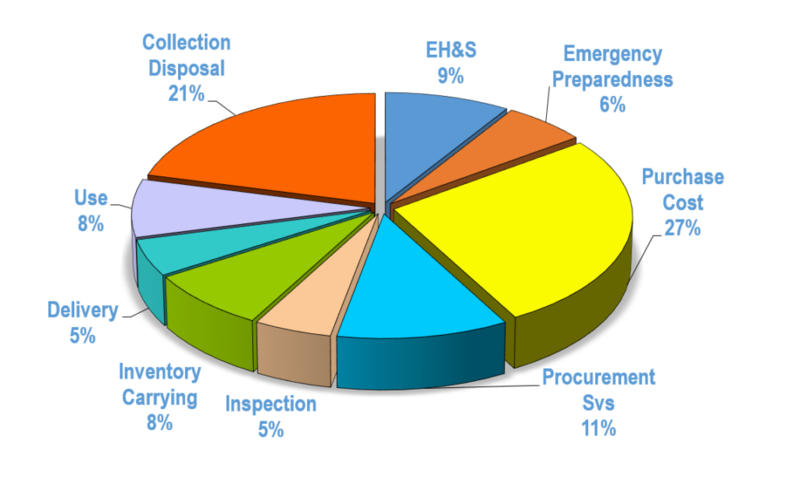 The chart below illustrates the total chemical lifecycle cost in an organization. This varies from industry-to-industry, but it is a good illustration of costs that are sometimes overlooked when it comes to chemicals. Since its enactment a few years ago, GHS labeling and SDS availability have become the focus of companies large and small in countries across the globe. GHS is an acronym for The Globally Harmonized System of Classification and Labeling of Chemicals. GHS is a not a regulation but a guidance to every country for uniform classification and labeling of chemicals, with the goal of improving workplace and environmental safety. With global trade in full swing, consistency of chemical hazards and warnings is paramount from third-world country producers to first-world country buyers of chemicals. China and India, in particular, as two of the world’s largest countries and producers and exporters of chemicals, GHS has been instrumental in reducing accidents stemming from improper handling and storage of chemicals. SDS is an abbreviation for Safety Data Sheet is a document that contains details about a chemical and its constituents and includes information on occupational safety and health for the use of various substances and products. The SDS replaced what was known as MSDS (Material Safety Data Sheet) and, like GHS, it helped standardize what was once varied inconsistent information across countries and industries. Although GHS and SDS are produced in most different languages around the world, their format and information remain constant. Cloud-based technologies like Chemical Safety Software’s Environmental Management Systems (EMS) offer both free and cost-effective tools for chemical management and chemical safety. EMS is a module-based enterprise-level health and safety software solution that is available on the cloud under a cost-effective annual subscription. Click here for a short video that describes the capabilities of EMS. https://chemicalsafety.com/sds-search is a large library of SDS and GHS labels that is free to access and use to find and print SDS and GHS labels. Many organizations have embedded this library into their corporate safety websites as an additional tool for easy safety data access. More info on embedding at https://chemicalsafety.com/embed-chemical-safety-sds-search.